Bone metastasis represents one of the most deleterious clinical consequences arising in the context of many solid tumors. Severe osteolysis results from tumor cell colonization of the bone compartment, a process which entails reciprocal exchange of soluble signals between tumor cells and their osseous microenvironment. Recent evidence indicates that tumor-intrinsic miRNAs are pleiotropic regulators of gene expression. But they are also frequently released in exosome-like vesicles (ELV). Yet the functional relevance of the transference of tumor-derived ELV and their miRNA cargo to the extracellular milieu during osseous colonization is unknown. Comparative transcriptomic profiling using an in vivo murine model of bone metastasis identified a repressed miRNA signature associated with high prometastatic activity. Forced expression of single miRNAs identified miR-192 that markedly appeased osseous metastasis in vivo, as shown by X-ray, bioluminescence imaging and microCT scans. Histological examination of metastatic lesions revealed impaired tumor-induced angiogenesis in vivo, an effect that was associated in vitro with decreased hallmarks of angiogenesis. Isolation and characterization of ELV by flow cytometry, Western blot analysis, transmission electron microscopy and nanoparticle tracking analysis revealed the ELV cargo enrichment in miR-192. Consistent with these findings, fluorescent labeled miR-192-enriched-ELV showed the in vitro transfer and release of miR-192 in target endothelial cells and abrogation of the angiogenic program by repression of proangiogenic IL-8, ICAM and CXCL1. Moreover, in vivo infusion of fluorescent labeled ELV efficiently targeted cells of the osseous compartment. 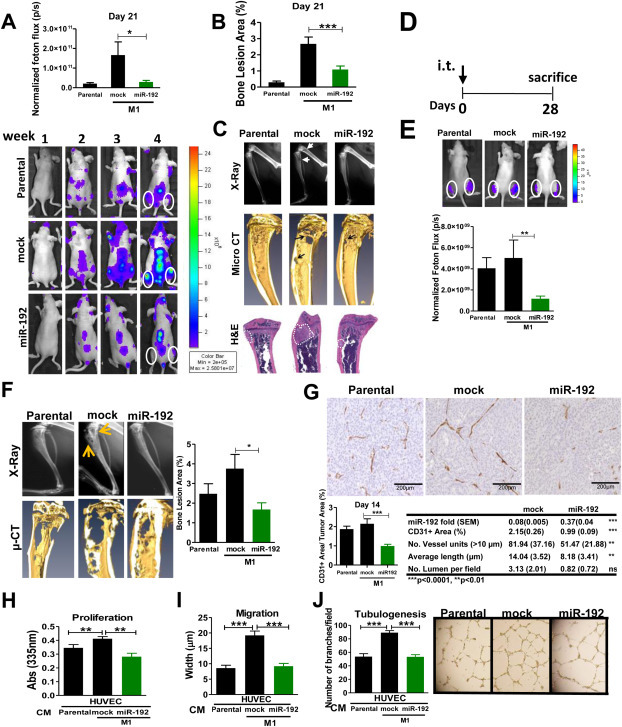 Furthermore, treatment with miR-192 enriched ELV in a model of in vivo bone metastasis pre-conditioned osseous milieu and impaired tumor-induced angiogenesis, thereby reducing the metastatic burden and tumor colonization. Changes in the miRNA-cargo content within ELV represent a novel mechanism heavily influencing bone metastatic colonization, which is most likely relevant in other target organs. Mechanistic mimicry of this phenomenon by synthetic nanoparticles could eventually emerge as a novel therapeutic approach.